Preservative-free recipes plus kitchen encouragement…because we all start somewhere! Yummy, but not a perfect unmolding. This week my bake-a-long group is making Hot Chocolate Panna Cotta, from Dorie Greenspan’s Baking Chez Moi cookbook. I’ve made Panna Cotta before, both from Dorie’s book, as well as my own creation, and both times the recipes called for gelatin as an ingredient. 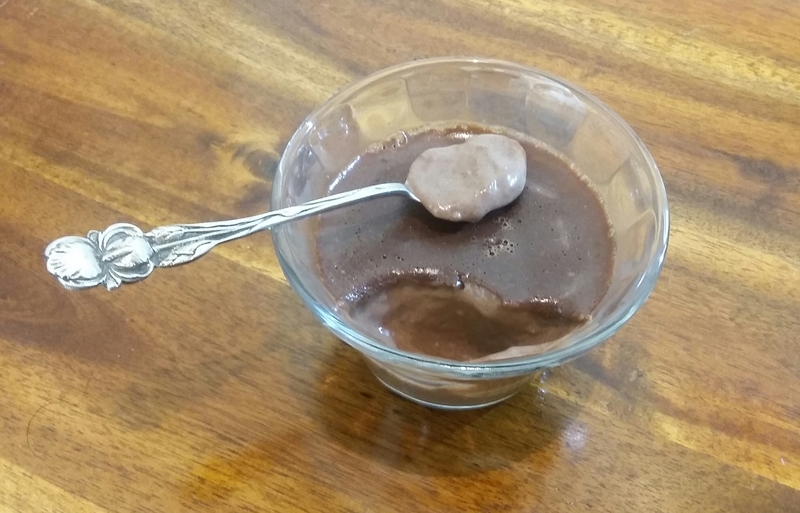 Being vegetarian, gelatin is a no-no, and since the DH doesn’t like chocolate, I had to figure out gelatin alternative so that I could eat up all the delicious, chocolatey goodness. According to peta.org, agar-agar can be substituted for gelatin on a one-to-one ratio. So, this is what I tried! I’m hoping it works out, as I love chocolate (surprise! ha.) and custardy puddings, and hey, what is panna cotta if not a custardy pudding? Panna cotta itself is very easy. In its most basic format, it’s mixing hot cream (and any flavourings) with gelatin (or in my case, agar-agar), letting the resultant mixture set. The panna cotta version I’m making today is basically a hot chocolate mixture made with cream (ah, delicious milk fat!) mixed with gelatin/agar-agar. Again, super-easy! The hardest part is waiting for it to set. I’m going to try both ways that Dorie talked about presenting the panna cotta: in the dish in which it set, as well as trying to unmold it for a fancier presentation. Wish me luck! Creamy inside, with a pudding skin top! And…done! 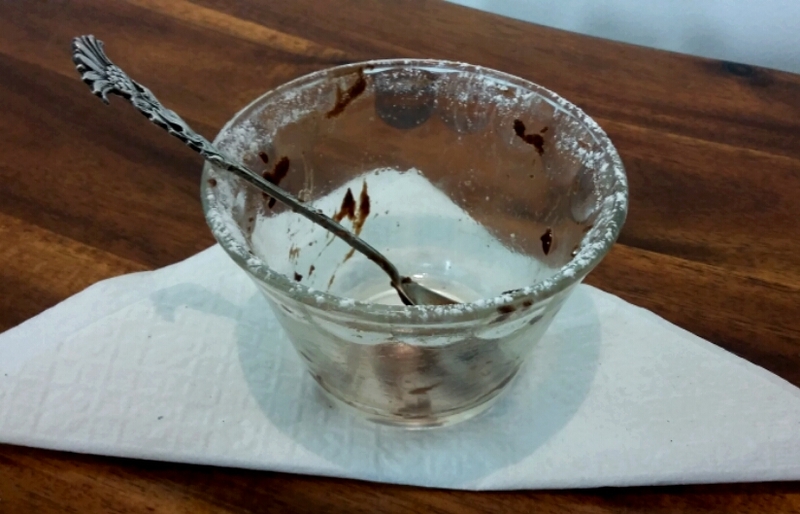 Ok, so I ate it, and indeed, it tastes like hot chocolate, but in jelly form. All I can say is, one serving is lovely; rich, and lovely. Two servings in one evening is too much. And that’s rare for me to say! Also, as you can see, it didn’t unmold super-easily, and wibble-wobbled all over the place. So I’d recommend doubling the amount of agar-agar used, and doing as Dorie says and straining the mixture before pouring it into the serving jars. Aside from that though, it was a lovely pudding! 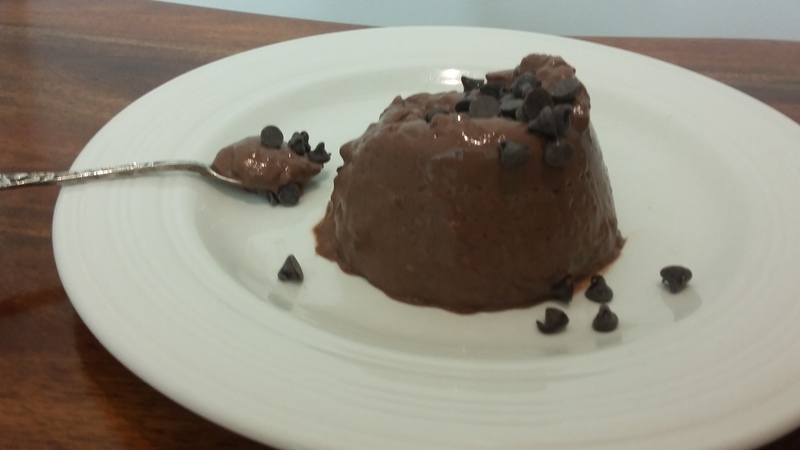 Reminds me of the chocolate vla (Dutch pudding) that my mum used to make! Oh chocolate, how I adore thee! This entry was posted in Cook-a-Longs R Us on February 23, 2016 by Margaret. 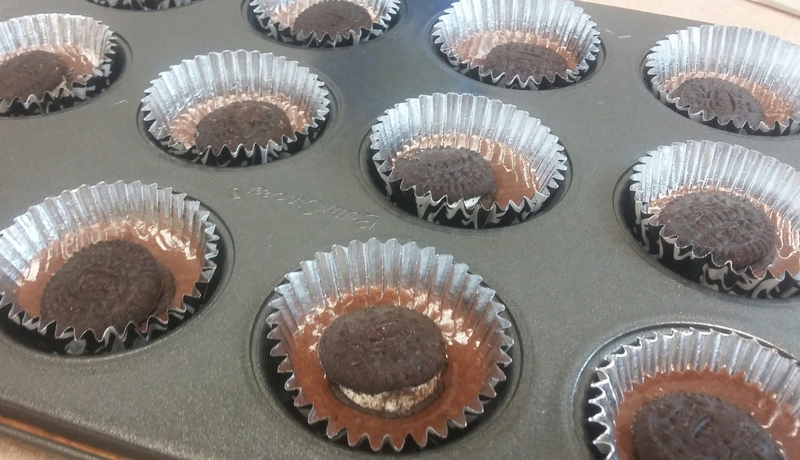 Oreo ‘Surprise Inside’ Mini Cupcakes: Deliciousness in an Indulgent Bite! Can’t talk, too busy eating Oreos. And…there was a surprise inside of the cupcake! Have you heard of this trend? Basically, you bake a treat into the cupcake. ‘Surprise Inside’ usually doesn’t refer to a filling in a cupcake (although it can), but something more, something a bit unexpected…like a cookie baked into a cupcake! They’re surprisingly easy to make? Shall we? Let’s! I used this recipe, because it makes the perfect chocolate cake — light, moist, and as fluffy as any packaged cake mix, but without the preservatives. This is my go-to chocolate cake recipe, for sure. 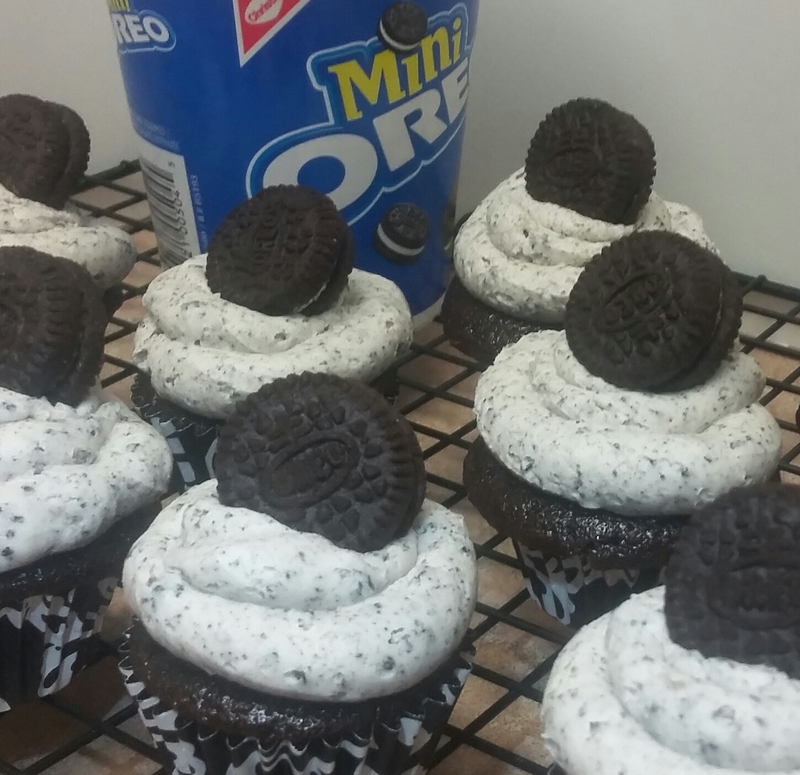 I was making a test batch of this recipe, so I mixed up half a batch of the batter, which made 1 dozen mini Oreo cupcakes, plus enough for another 6-12 minis (I made a mini 3-layer cake instead, because I just got a new mini cake tin that I wanted to try out). You can make 2 dozen mini cupcakes with half of this recipe, is what I’m trying to tell you. 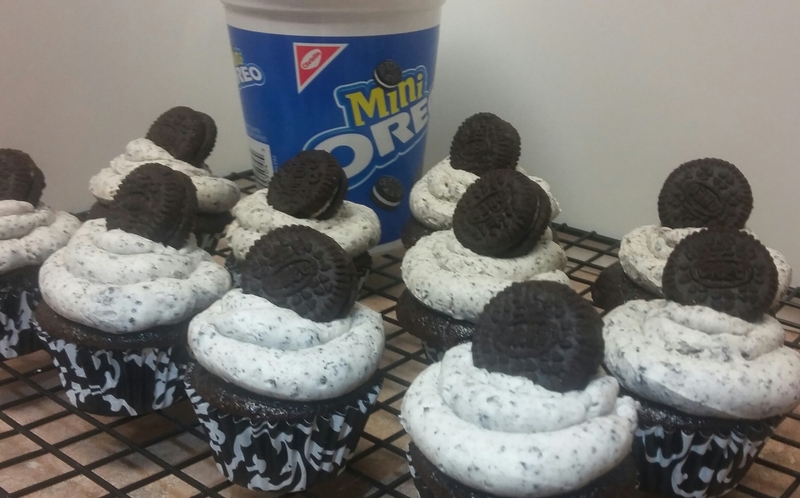 Fill with batter halfway, then top with mini Oreo. Mix up batter. Place mini cupcake liners in a mini cupcake tray. Fill cupcake liners half full with batter. Place mini Oreo cookie on top of batter. Top up each cupcake liner with more cake batter, until a smidgen below the top of the liner. Cookie may float a bit, but that’s ok. Bake in a 350 degree oven until set and the top of the cupcake bounces back when pressed gently with a finger. Cool. You may notice a slightly differently coloured part on the top of the cupcake if your cookie floated; that’s ok! Top with more batter, then bake. Fit a piping bag with a round piping tip, and fill with Oreo buttercream. Make sure you do not use a fine piping tip, because Oreo crumbs will block the tip (ask me how I know) and pipe on cooled cupcakes. Top frosted cupcakes with another mini Oreo cookie. And voila! An impressive mini dessert that tastes as good as it looks! Mix butter and shortening together until…mixed. Add in icing sugar, milk, and vanilla extract. Whip until super-fluffy and then whip some more (that’s how you get that super-fluffy bakery style frosting; don’t worry if you think it’s too fluffy, as it’ll firm up later, especially if you chill it). Stir in 20 crushed mini Oreo cookies (crush in a Ziploc bag with a rolling pin). Taste test but try not to eat the entire thing with a spoon. And voila! Oreo Buttercream Frosting (oh, those sweet, sweet words!) is done! 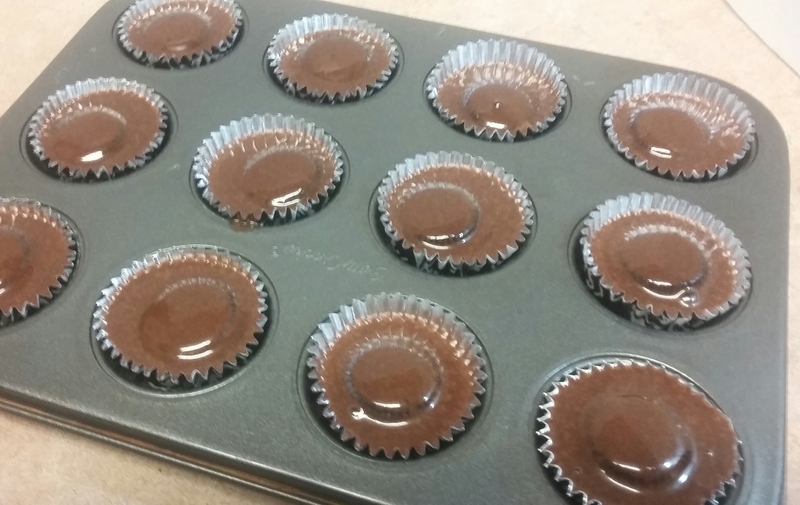 Kitchen Hack: Use a dollar-store ketchup squirter container for easy filling of the cupcake tin with batter. I have an official cupcake batter pour-er thingy, but really the dollar store version is almost as good. Helps avoid the messy dribbles when dealing with small amounts of batter! Picture done? Time to eat! I made this batch of cupcakes as a test to see if I liked the flavourings, and it certainly worked out! I brought them to work and they were eaten, every last one. I’ll be baking another batch (but full-size this time) later on in the month to raise funds on National Cupcake Day. Cupcakes, Oreos, and a good cause…these are a few of my favourite things! If you make a batch of cupcakes, let me know if you switch up the surprise inside — just imagine how they would be with Golden Oreos! Or Mint ones! Post-Pub Edit: As I’m ever in search of that viral recipe, I’m taking part in another Meal Plan Monday link-up. Check it out here, on Christy Jordan’s blog! This entry was posted in Cakes, Desserts Not Otherwise Categorized on February 20, 2016 by Margaret. This month my bake-a-long group is making Soft-Centred Chocolate Teacup Cakes (aka Chocolate Lava Cakes) as well as Hot Chocolate Pannacotta from Dorie Greenspan’s Baking Chez Moi cookbook. We’ll be making one item this week, and one item two weeks from now. 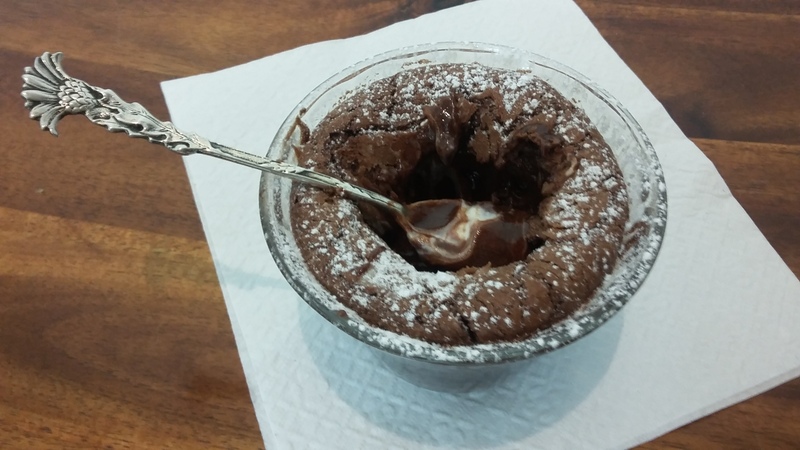 I decided to make the Lava Cakes today, as I had made a Chocolate Rum Mousse on the weekend and didn’t feel in a pannacotta sort of mood. 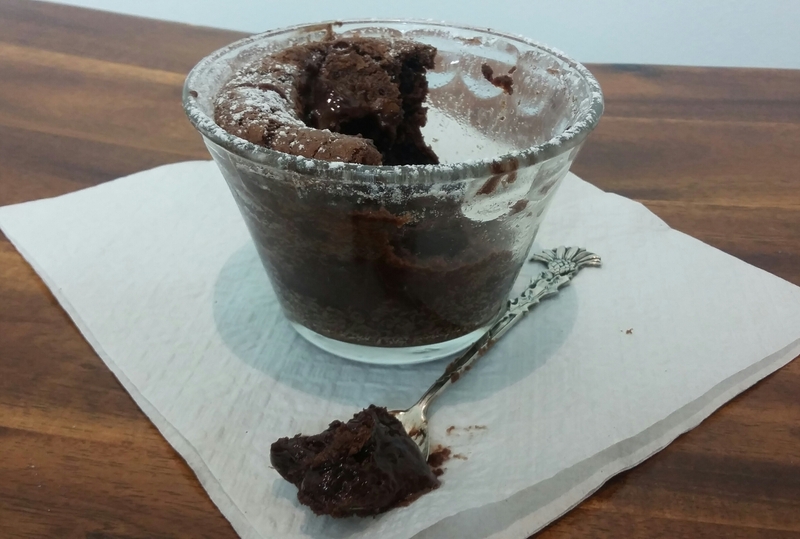 Chocolate Lava Cakes, though? I’m always in the mood for that! I’m balancing out my chocolate intake with some fruit, just so I can feel healthy. A kiwi? Super-high in vitamin C, which is what I need right now, as I’m trying not to get the nasty flu-ish cold that the DH has. So vitamin C for health reasons and chocolate because…chocolate. Chocolate never needs a reason in my books! Speaking of books, as I was reviewing the recipe in the cookbook, I noticed that Dorie calls for 3 eggs for the 4 servings of lava cake. Since I decided to only made half the recipe (one serving for dessert for me today and one serving for lunch for me tomorrow), I decided to throw caution to the wind and only use 1 egg as I didn’t want to have half an egg sitting in the fridge (and I didn’t want to fry up a 1/2 egg omelette). Dorie also calls for 5 oz. of chopped chocolate for the 4 servings. But I got the amounts of my halves and my wholes confused and put in 5 oz. of chocolate for 2 servings. This is why it is a good thing to do your recipe calculations before you start baking! It would also be wise to write down the halved amounts of the ingredients on the actual recipe. Neither of which I did. I filled my ramekins halfway with the batter, then popped some Belgian white chocolate wafers on top, and poured the remaining batter over that. After baking, and the mandatory cooling off period (if it doesn’t burn my tongue, it’s cool enough! ), I took a bite. Next Post: I go in search of the perfect dinner roll. Easy? Tasty? Fluffy as all get out? Bring it on! This entry was posted in Cook-a-Longs R Us on February 10, 2016 by Margaret. Adventures in Indian Food, Part III: Channa Masala-Stuffed Samosas! Yum, yum, in my tum! Hey all! It’s Sunday evening and I’m sitting on the couch with my laptop, planning meals for the week while some bread dough rises in the oven. It’s time to catch up! I’ve written about how to make grind-your-own garam masala, as well as how to make channa masala, and now for the piece de resistance…channa masala-stuffed samosas! Like most recipes I tackle, they always seem intimidating, and then once you actually get into it, you realize that it’s actually not very difficult at all. Which is why I write my favourite catchphrase “it’s so easy!” so often. While this isn’t the easiest recipe in the world (I think this one is), it’s not nearly as complicated as one might think. Just try it, yes? I mixed up a couple of different flavours in this recipe, like garam masala and sesame oil…but it works! Set out your ingredients on the table/counter in front of you (this is called ‘mise en place’, but I’m sure you all know that already). You’ll want to place the rice paper wrappers on a plate with a damp cloth over them. Mix the flour and water into a thick, goopy paste, and set that in your mise en place as well. You’ll be using this edible glue to seal the edges of the rice paper wrappers together, so that the filling won’t fall out. Set your dish of channa masala beside your workspace. Taking one of the rice paper wrappers, fold it as shown in the photo (or check out this video I found). In the final step, make a little pouch and spoon a tbsp. of the channa masala into the little envelope you have just made. Put some of the ‘glue’ on the flap, and fold it over. You’ve made a samosa! Go over the samosa and if there are any bits of rice paper that aren’t sealed, use your ‘glue’ to seal them. As you make each samosa, place it on a cookie tray. 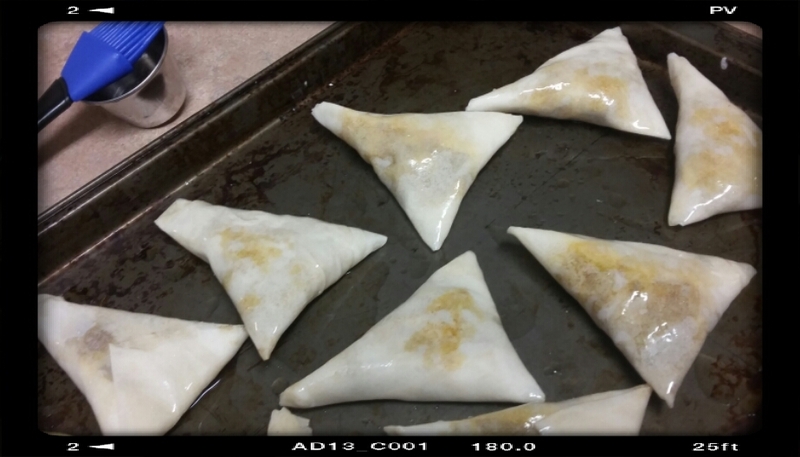 Once you have made up all the samosas, brush with a mixture of the vegetable oil and the sesame oil. You can brush the bottom of the samosas too. Bake in a 375 degree oven until golden and crisp on the outside. Serve with a chutney dipping sauce or simply by themselves! Baking the samosas instead of deep-frying them means that they’re healthier. So indulge guilt-free! Also, ignore my “well-seasoned” cookie tray. I can’t be bothered to scrub it with steel wool, so “well-seasoned” it will stay! 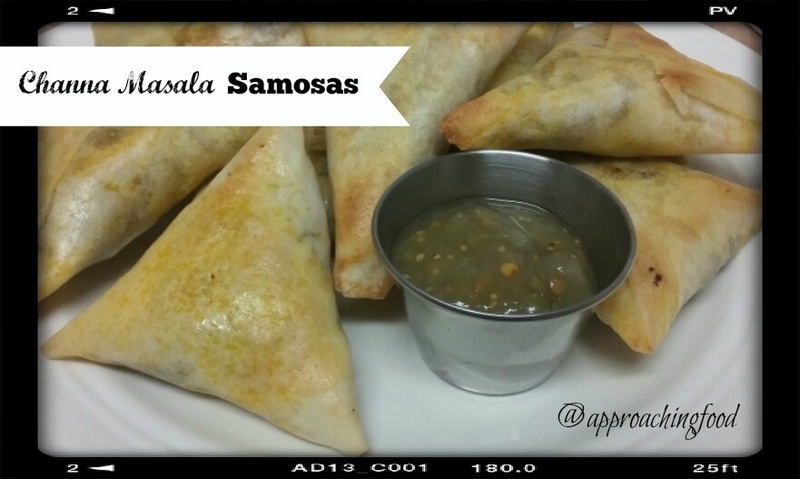 I made a batch of these samosas one evening and stuck them in the fridge after eating one. The DH popped in the kitchen and grabbed one to munch on. He seemed to like them, which I was rather gratified about, as he usually doesn’t like anything with spice, no matter how mild. Well. To say that he seemed to like them is an understatement; the whole batch was gone in 24 hours! How long will it last in your household? Make them and let me know in the comments! Next Post: Maybe some more of my bake-a-long posts, maybe the start of a new recipe odyssey. The bread rising in the oven does smell rather delicious! Now linking up at Meal Plan Monday! This entry was posted in Vegetarian Side Dishes on February 8, 2016 by Margaret. Want fresh content delivered to your inbox? Subscribe to my blog posts & get a FREE copy of my e-book "This for That: Easy Kitchen Swaps & Hacks." It's hot off the presses!